Storage Options Scroll 51951 - tablet - Android 2.1 - 8 GB - 8"
alaTest ha raccolto ed analizzato 9 recensioni da riviste e siti web. Le persone rispondono positivamente alla prezzo. Il prezzo ha ottenuto inoltre buoni opinioni, tuttavia si possono individuare recensioni non positive circa la performance. Abbiamo analizzato differenti valutazioni di esperti ed utenti, età del prodotto ed altri elementi. A confronto con altri prodotti, Storage Options Scroll 51951 - tablet - Android 2.1 - 8 GB - 8" ha ottenuto un alaScore™ complessivo di 80/100 = qualità Molto buono. 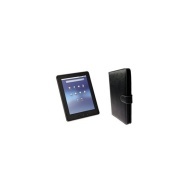 A budget Android tablet with a 1GHz processor and 7in screen. in some respects. The front is now glass rather than plastic, sturdiness has increased and the backplate looks a lot nicer. However, it's still roughly the same look at work. This tablet ticked loads of boxes for me and has many uses for all the family. The kids love watching films on it in the back of the car, the missus spends hours stalking old school friends on facebook and i us it for emails and surfing the web. A very good tablet at a winning price ! !